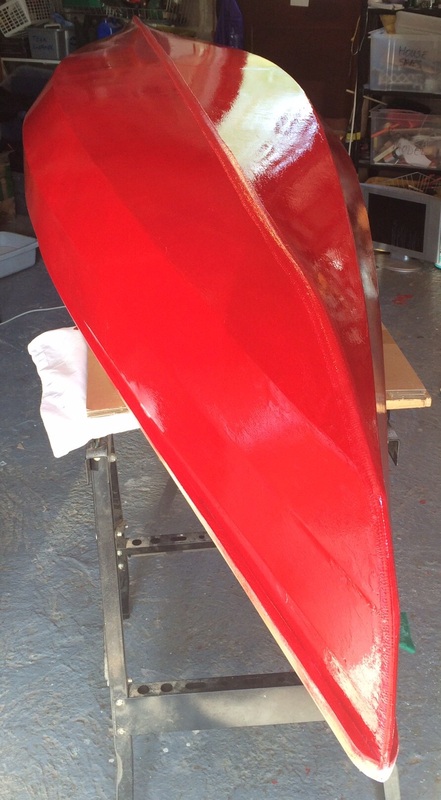 Canoe weight 11kg, (4mm ply, tapes seems inside only and 200g carbon on inside bottom panel in the middle only). 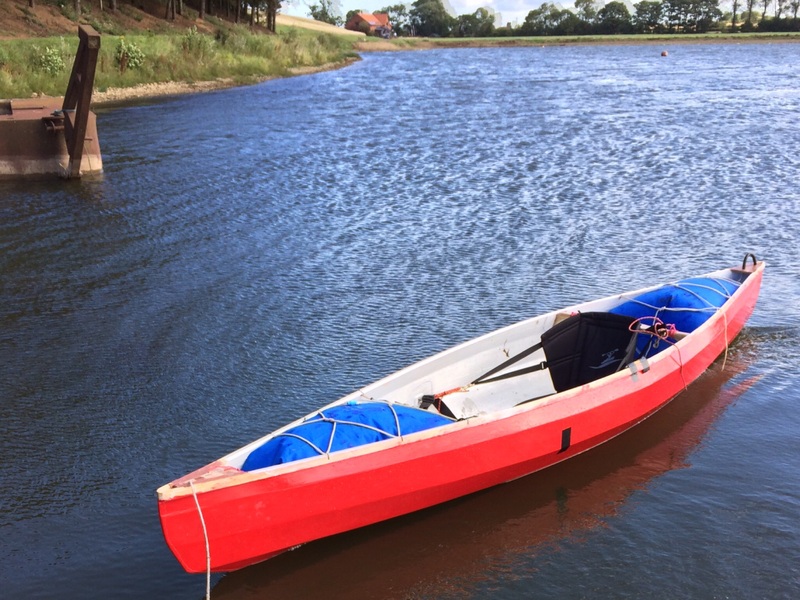 Took him out for a quick test paddle before finishing off: fitting out, foot rests, Kevlar around the gunwales, sanding, fairing and painting. Went like a dream, very stable easy to paddle no vices what so ever, very happy. 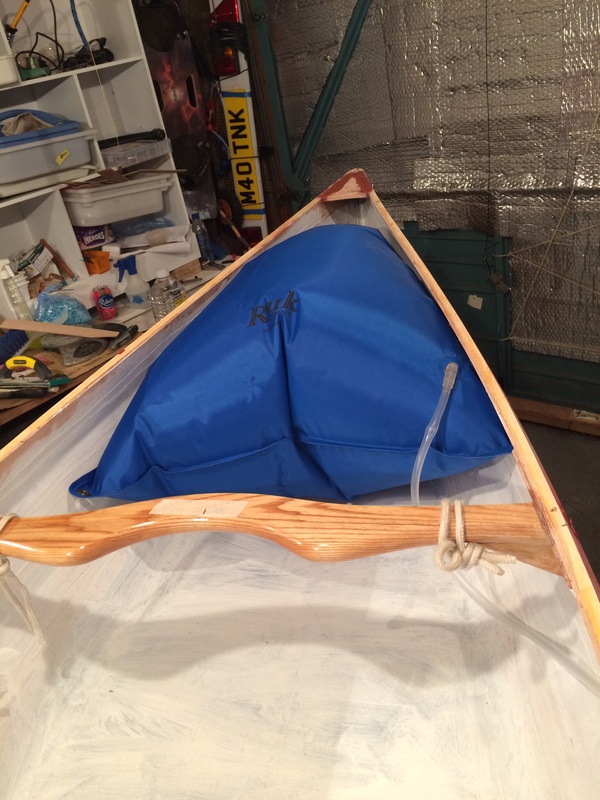 Starting to plan and fit out the inside, have bought a seat and bow / stern buoyancy bags. Bonded on reinforcements for the front seat straps, 4mm ply and glass tape. 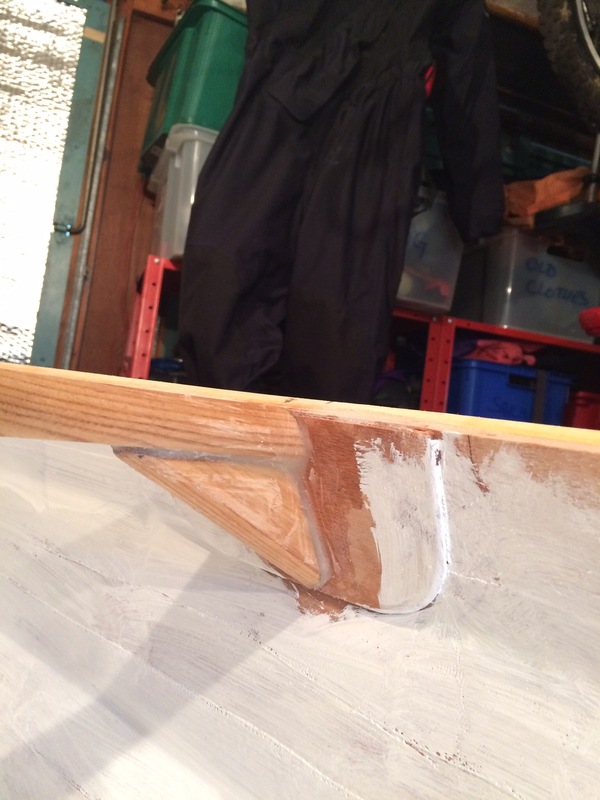 Sanded the bow / stern areas to remove any sharp points that may puncture the buoyancy bag and then applied a second coat of primer. 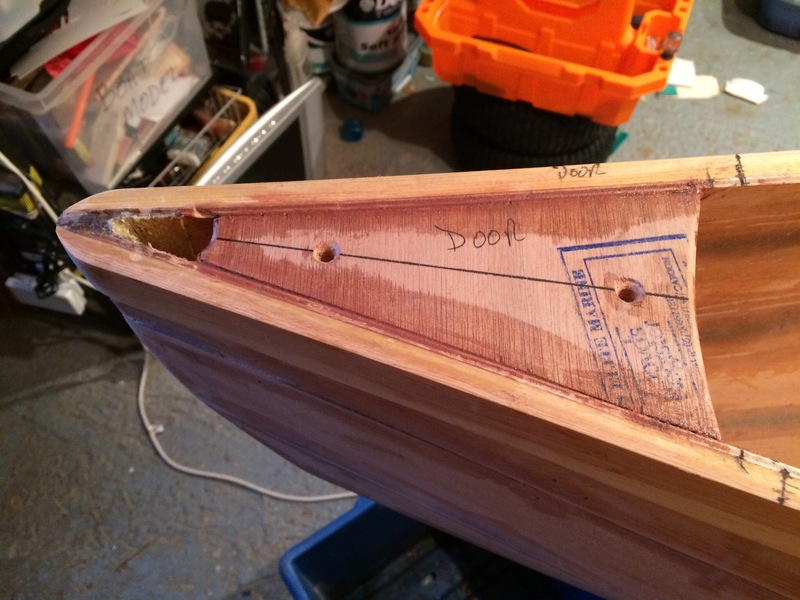 Laminated 25mm Kevlar tape from stem to stem over the keel, used peel ply and masking tape around the stem. 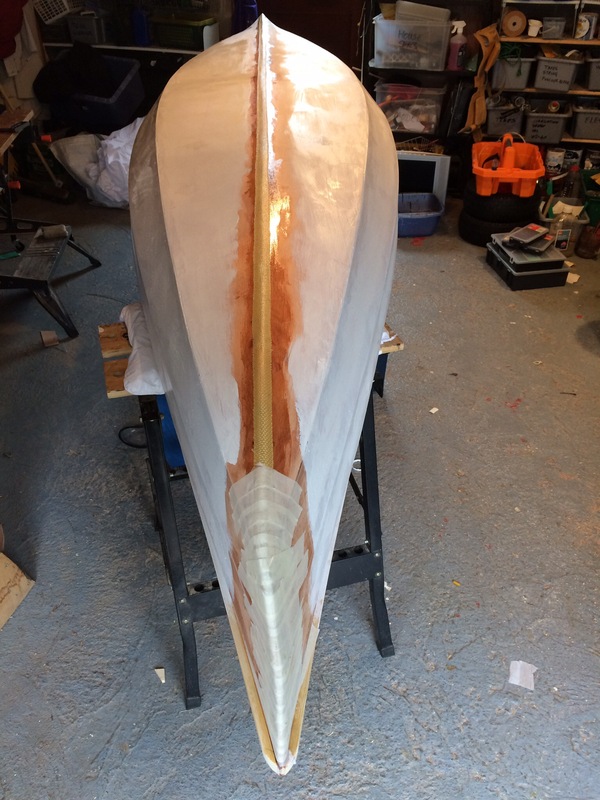 Also primed the outer hull And a few hours later filled the outside using the DIY filler recommend by Selway Fisher and a few blogs / forums – fingers crossed it holds up. 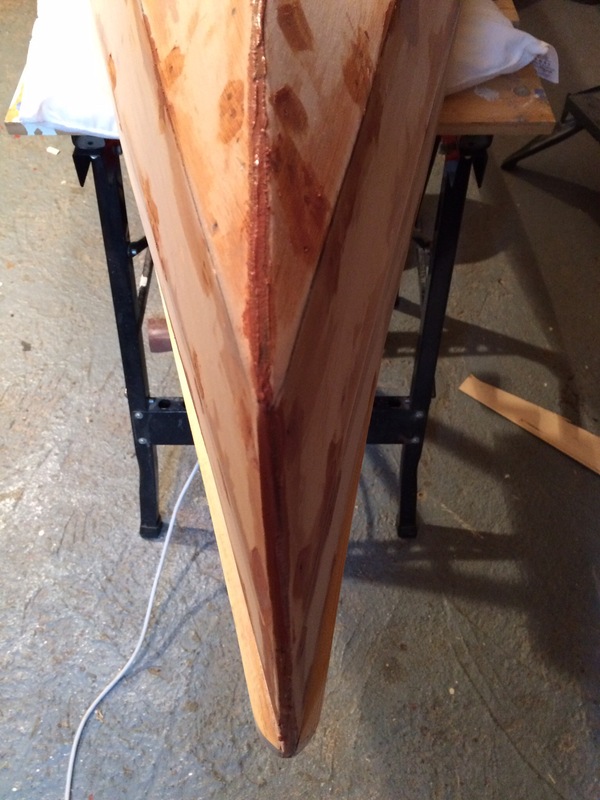 2, trimmed to top of the upper strake to the out-whale using the router and profile bit. 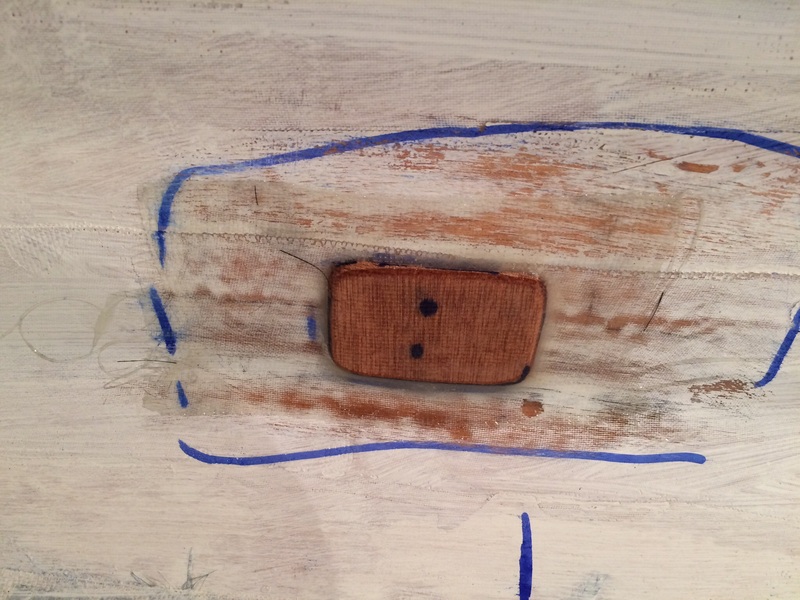 The out-whale was glued about 0.5mm lower than the strake to allow for a nice flush gunwale. Made and glued in two breast hooks from 12mm ply, these are the minimum size I think will work and have provision of a rope handle. 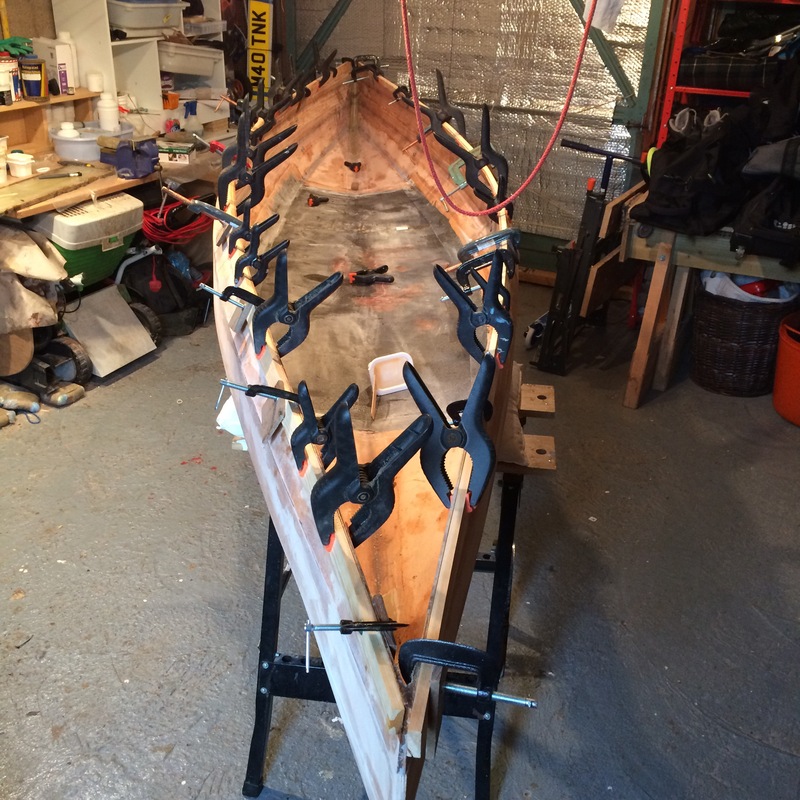 Before gluing made a spreader bar to force the overall width to 30″. 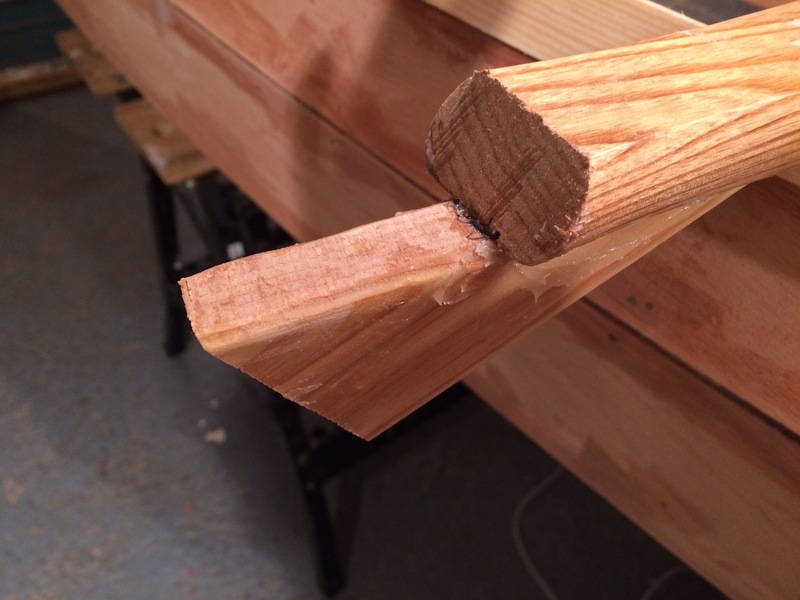 Very carefully marked out and cut the double bevel for the yoke. 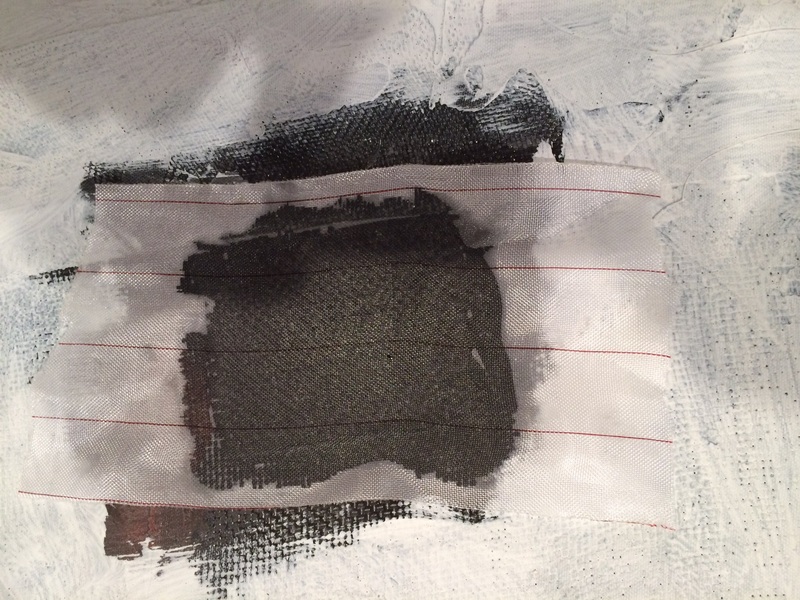 This has worked well and very pleased with in. Made some 4mm ply reinforcements for where the yoke would attach and some brackets for the yoke ends from the yoke off cuts. Have positioned the yoke at 65% LOA. 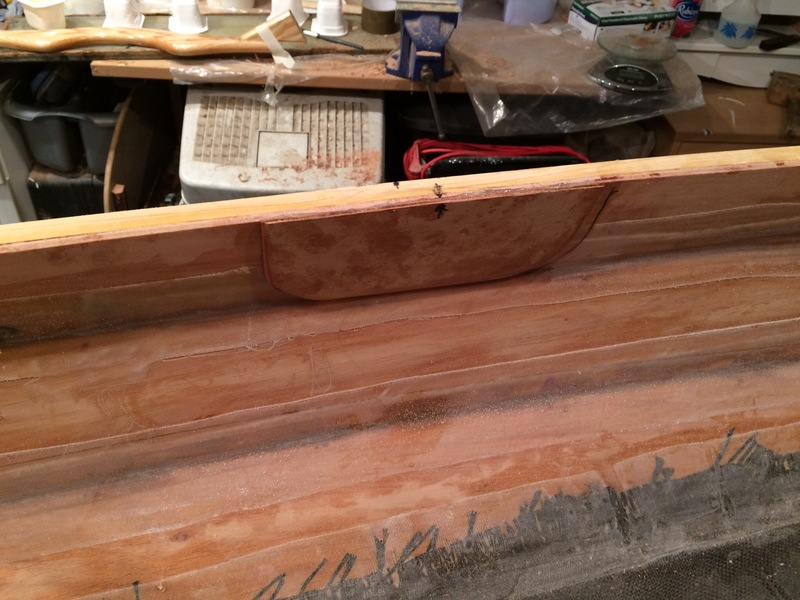 Also sanded the bow / stern ready for the Kevlar outer keel.